This delicious healthy recipe has absolutely no dairy, soy, gluten or added sugars. It was created by health food experts Nana Bowls. 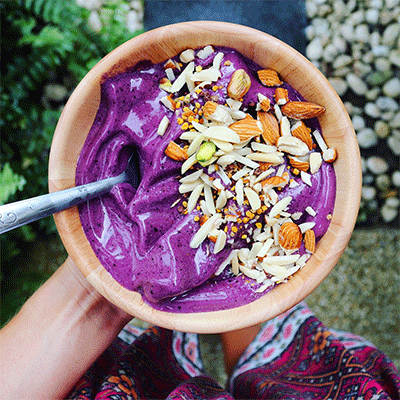 Add the frozen bananas, blueberries, strawberries, rosewater, coconut milk and cold water to a high powered blender. Blend well for about 30 seconds. Then add in your protein powder and blend again until a thick, smooth and creamy texture forms. Pour into your bowls and top with the crunchy almonds, crushed pistachios, bee pollen and cacao nibs. You can also add some toasted coconut flakes, homemade granola or a drizzle of nut butter for some extra goodness.